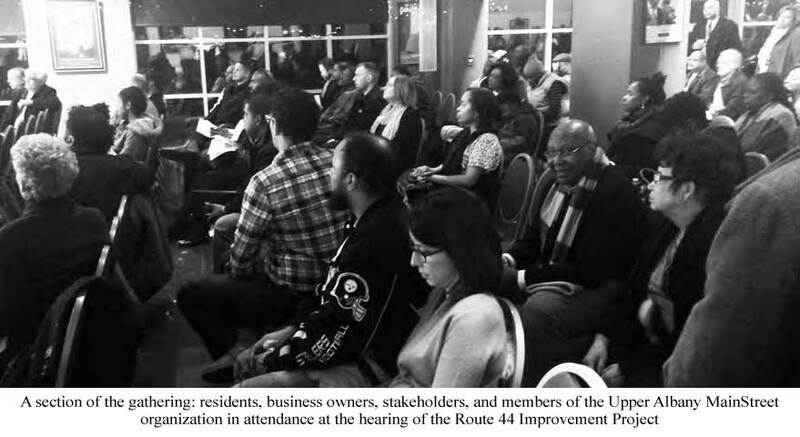 On January 5, 2017, the team managing the Route 44 Safety Improvement Project convened a Public Open House and a status update. The event was held at the Artists Collective located on Albany Avenue. The Route 44 Safety Improvement Project addresses safe­ty issues along Albany Avenue from Homestead/Westbourne to Bedford Street in the Upper Albany Neighborhood and also a western portion of the Clay Arsenal Neighborhood. Increasing the safety of this corridor will be accomplished through the installation of new traffic calming measures. These include intersection and traffic signal improvements, crosswalks with bulb-outs to reduce crossing dis­tances, sharrows, landscaping, brick sidewalks, and decorative lighting, just naming a few of the proposed transformations. These improve­ments will create a comfortable neighborhood destination that is safer and more enjoyable for resi­dents, businesses, and visitors. Bidding and construction of the project will be overseen by the Connecticut Department of Transportation. The City of Hartford will assist as needed and when improvements impact city streets. It should also be noted that the date for completion of the project might vary to some extent based upon factors including con­tractor questions during bidding, weather, or other incidentals that may occur. Attendees asked many questions about the project, includ­ing how residents of the area will be affected by all the changes. There were 54 visitors during the daytime Public Open House session and over 100 for the evening’s status update on the Route 44 Operational, Safety and Streetscape Improvements Project. America, A Return Of Jim Crow?